Mr. Micawber Enters The Internets: I'm sorry. Maybe next time. How to decide what to read? The big question for any of us. As a reader by profession and persuasion this is a daily battle. I pick things up, skim a few pages, and move onto something else. As a rule I try to only read two novels at one time or my brain scrambles the characters and plots into one bizarre mess. Generally I am reading 2-4 non-fiction titles at a time. Lately, however, everything has gone haywire. In the past few weeks I have finished novels by Peter Geye, Joshua Henkin, Lou Berney, Esi Edugyan(for the second time) and Michel Houellebecq. There are dozens of others I have stared at and thought, "I really should read that soon. Maybe when I'm done with the next one." Karl Taro Greenfeld's "Triburbia" is the novel I currently read 10-15 pages a day of. Piles and stacks of books consume my life--and I'm happy with that fact. There are several novels from Clarice Lispector that I just got in the mail from my friends at New Directions. I want to read Jesmyn Ward's amazing "Salvage The Bones" again because it throttled me the first time. Re-reading, depressing as it is, seems like three steps back for me. I promise myself no more new books until I finish the current group. But that promise is empty as the 'current' pile never really gets to an end. In the non-fiction world I am currently reading David Halberstam's NBA classic "The Breaks of the Game" despite the current woes of the Minnesota Timberwolves. I am also very, very, close to finishing Douglas Brinkley's "The Great Deluge: Hurricane Katrina, New Orleans, and the Mississippi Gulf Coast" which is a beast of 768 pages of pure sorrow. I love it and it terrifies me. I've just begun to stick my toes into Benjamin Busch's "Dust To Dust" which was recommended by several customers and I loved many of his father's, Frederick's, books. Maureen Stanton and Cheryl Strayed are two writers I keep taking glances at despite the fact that I've read their most recent work. Every single day a customer says something along the lines of, "I really don't need to buy this because I have a stack at home." I get this sentiment and feel it myself. But the waves of things we(or I) must/should/could read always keeps moving. All of this goes without mentioning the collections of poems I've been perusing for National Poetry Month. It's, I've been told, a fairly good problem to have. Too many good books and ideas. Too many pretty pictures. Sometimes, I must admit, it drives me a little crazy. What to read next? How to decide? I am, in the end, just like every other reader out there--choosing randomly and hoping the pile goes in the right direction. Which way that is I'm not entirely sure of. I really try not to discuss books that aren't available to the public yet but I do need to post one blurb regarding Peter Geye's "The Lighthouse Road" which comes out 10/16/2012. 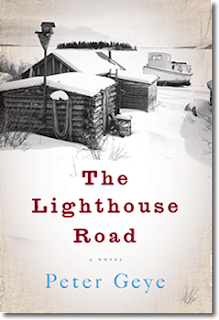 "THE LIGHTHOUSE ROAD is a small marvel of a book. The story is set in northern Minnesota in the late 19th and early 20th centuries, and Geye's expert rendering of a time long past -- the brutality of backwoods logging camps, the heartbreak of an era when immigration meant never going home again, the logistics of whiskey-running -- is matched by the complexity and depth of his characters. A beautifully written, elegantly constructed novel." - Emily St. John Mandel I've got one free copy to the first person who responds to this post. You did. Should I mail the book to you or do you want pick it up in-store? I will pick it up in-store. Love an excuse to visit. :-) Thank you!! I love this entry--paragraphs or no. Wish I'd read it sooner! Put me on the list for a copy when the books come in.